1. The “Hour” of the GC28 and young people. – 2. How is our Congregation getting on? – What weaknesses are more apparent? - 3. The missionary spirit of the Congregation, a source of hope. Recently in the Acts of the General Council (N. 427) the letter convoking the GC28 was published. As a result of the reflections of the General Council in the month of April and of my own personal vision/view of the Congregation, I issued there an invitation to consider the wonderful opportunity offered to our Salesian Congregation, as in fact in all General Chapters, to take another step forward along the path of fidelity to the Lord in the footsteps of Don Bosco. In that issue of the Acts of the General Council many points to be taken into consideration by each of the Provinces and Vice Provices in view of the General Chapter were indicated and explained in practical terms. Now we are taking advantage of the publication of this issue of the Acts to send you some further reflections and deliberations of the General Council together with information about the agenda and the animation provided by the Rector Major and all the members of the General Council. For my part, this new issue of the Acts gives me the chance to send you dear Confreres my greetings and to write a very informal letter which is meant to be a fraternal and frank communication. From this pount of view I have to tell you that I feel very much in tune with the style of writing employed by the first Rector Majors, who, in contexts certainly very different from our own, used to write to the confreres in such a close and familiar manner that it seemed they were in touching distance of all the members of the Congregation; as though they were all living there in Valdocco. Reading many of the letters of Don Rua, Don Albera, Don Rinaldi, I have enjoyed and experienced those pleasant feelings. I have already spoken about this in the letter convoking the Chapter. Certainly the next General Chapter, that is just round the corner, needs an appropriate preparation by each of the Provinces and Vice Provinces. I can assure you that as the General Council we are awaiting this event with great hope; and we are sure that it will be another time of grace and an outpouring of the Holy Spirit for our Congregation. I can tell you that in these months up to the present I have received a large number of messages both from Provinces and from individual confreres grateful for the choice of the theme, and with words of encouragement to prepare and to live it as a special opportunity to continue on the path in fidelity. I have welomed the suggestion from the Moderator of the General Chapter to organise everywhere, in each Province and Vice Provice, a process of consultation of the young people in our centres. I want to emphasise this particular idea. Dear Confreres, let us ask the young people, all of them: those close to us and those further away or those from whom we are at some distance. Let us ask them what they want from us; how we can help them, and how they can help us to be like Don Bosco more faithful to the Lord. Let us not miss this opportuntity. Together with us Salesians of Don Bosco they can be other people with a part to play in our Chapter. Their participation in the Chapter Assembly will be – I presume - “symbolic”; but even if they cannot take part physically in all the stages of the GC28, they will make their presence felt through their words – youthful, strong, courageous and even “daring” which we will accept with an open heart. By way of example, and in the same informal way with which I have begun this letter, I want to share with all of you two letters that I recently received. The first is a personal note that reached me on “facebook”; and the other is what a young man I met on one of my recent visits said to me. I have just seen your message about the 28th General Chapter and I have decided to write to you just to tell you something: the theme of the Chapter seemed to me a marvellous one. I had already spent some time thinking about the sort of Salesian that our situation needs and that we young people need, based on my personal experience, which I have had with Salesians who have accompanied me all the time I have been growing up. It seems to me that the Chapter can directly involve us, young people in formation-accompaniment situations or already youth leaders, since we are very open to the opportunities that may be offered to us. To be honest, sometimes I felt a bit sad since apparently for some Salesians other things seem to be considered more important such as the accounts, household affairs, the finances, the buildings, management etc. All the same, the invitation to put in the first place things of the heart fills me with joy; I am really filled with great hope by the challenge to leave our comfort zones, because we really need Salesians of conviction, with dreams and passion, who can be living witnesses to the love of Christ, and be for us an example of all that Don Bosco stood for. I believe that in this way we can once again fall in love with this way of life, and make our dear Salesian Family continue to grow more and more, naturally with everyone playing their proper part. I keep you in my heart. On my last visit to Mexico a young man from the Salesian Youth Movement gave me this letter after having first read it out in public. First of all I want to say hello and thank you for all that you are doing. As a young person of the Salesian Movement it is a real pleasure to be able to share with you a little of the experience of my community. I am A.K. and I am 23 years of age. I originally come from the frontier region, from Nuevo Laredo, Tamaulipas. It is quite a challenge to be writing these words knowing that they are going to be read by the successor of Don Bosco, our beloved Don Bosco, the person who has inspired thousands of young people to change their lives for the Love of God, to have unforgetable experiences and to get to know themselves more deeply. I can tell you that I have known the Salesians for 10 years. I consider it a great blessing to have seen an Oratory come to life out of a veritable rubbish dump; the joy of seeing how a community was gradually formed, one that wanted to work, to make a difference, to cultivate a space of joy, of living together, of peace for our children and young people, a place in which to love Christ freely, devoting time and effort. During this time it has been difficult to keep the Oratory going because of the difficult surroundings full of drugs, alcohol, trafficking, illegal immigration, and where those most in danger are the boys and girls. The constant struggle everyday is difficult, a struggle involving everyone. The support of the Salesian community and of the volunteers who accompany us and who try to keep the youngsters free from the situations must be given due recognition. Yet at the same time there are young people full of love for Jesus and for Don Bosco, young people who have found a second home, new friends, a place where we can express ourselves and enjoy ourselves in a healthy way. For this reason we the young people of Nuevo Laredo want to say to Don Bosco that like him we want to be courageous in coping with so many problems without losing hope and without giving up, always fighting for our dreams, even though we don’t know how far we may have to go, Many of us continue to ask ourselves what we have done to have been chosen to know and to live in an Oratory and there to learn to follow the example of Don Bosco. It thrills us to know how he devoted his time and his life to those most in need giving them a place to live, sending people to accompany us, passing on to us the same strength to believe in Jesus and to live following his example. Many of us cannot imagine a life without Don Bosco, without the Salesians, and we can say that we would not have come to love God in such a “mad”way full of laughter and marvellous experiences, without him. Don Bosco, you led the lost, who without knowing the way their lives were going have found the answer inside this house, school, church and playground. . Here then are two personal accounts that tell us how important for these young people is the way of life in the Salesian setting in which they find themselves, and how this Salesian environment has brought them and continues to bring them to an encounter with Jesus. At the same time, they are asking us to be close to them, to walk beside them - especially in their important decisions, the most signifiant ones, those that really touch their lives and their hearts. While I was writing this I was thinking: the witness of two young people is already telling us so much; how much greater will what is said by thousands of young people be when it reaches our General Chapter. This will enable us to hear their heartbeats, and it will not leave the Chapter Assembly indifferent because it will be the expression of the Holy Spirit who will also be speaking through them. That which keeps us far from young people will not save us nor will it strengthen our vocation. Administration on its own, or the management of plans and projects will not make us better Salesians in the style of Don Bosco. Only the young will make our hearts ever more Salesian; as happened with Don Bosco’s boys who with the grace of God enabled him to live until his last breath giving himself for each one of them. This conviction requires from each of us an affective and effective presence among the young. One of the expressions of the “return to Don Bosco”, that we took up as a programme for the whole Congregation in past years and which ought to be permanent is the affective and effective presence among the young. This means that we must cultivate our Salesian heart that beats strongly faced with the situation of our young people as we dream and hope what is best for them, wanting to share their way of life as the two young people witnessed in the letters that I have transcribed. They need us and want us at their side to accompany them on life’s journey. Undoubtedly the Congregation is enjoying good health, At the same time I think that one can say that the letter from Rome written by Don Bosco remains always relevant. Not because there is not a Salesian atmosphere in the places where we are, but because we have to demand more of ourselves in this area, always more, much more. We ought to be able to be proud of the fact that every boy, girl, teenager and young person in the world who find themselves in any Salesian house and who need the presence of a Salesian as a friend, a brother and a father can always find one. Dear Confreres, without overstating the case, I would dare to say that in today’s world there a great “crisis of paternity”. There are so many pointers, and the specialists in the field clearly provide the evidence for it. Well then, in Salesian houses our boys and girls ought to find that atmosphere which in all freedom helps them grow in all aspects of their lives. They ought to meet people capable of accompaanying them in this way in the areas of their lives in which they feel vulnerable and insecure. 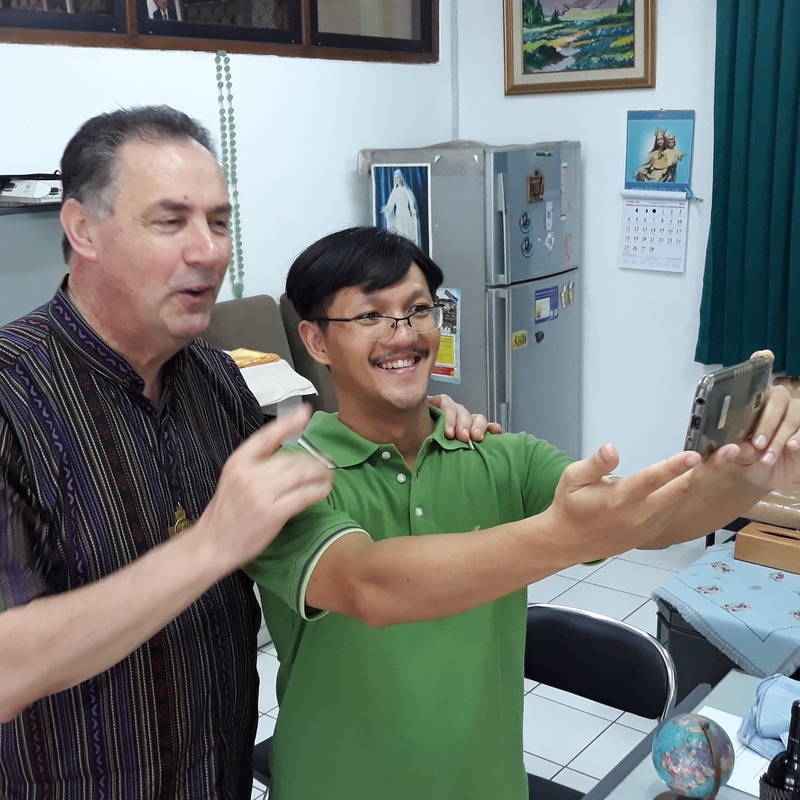 They need to meet educators, Salesians of Don Bosco and lay people who because they carry Don Bosco in their hearts and always look back to him, are ready to welcome all young people in their varied situations just as they are. 2. HOW IS OUR CONGREGATION GETTING ON? In my visits to the Provinces I am often asked this question. During the celebration of the GC28 we will provide information on the state of the Congregation. Obviously the depth and breadth of the topic do not allow me to reply adequately to this question now. In any case, dear Confreres, in all sincerity and objectively speaking I can state that the Congregation is enjoying good health. We are pursuing or trying to pursue a steady path of fidelity; with our strengths and weaknesses as is normal, but following in the footsteps of Don Bosco. The nine “Team Visits” undertaken have indicated what I am saying, as also the evalutation that we have reported on those occasions. In this regard I mention just a few pointers, well aware that this is only an initial outline and in no way exhaustive. => Young people continue to be at the centre of our mission and must continue more and more to be so. And among these the poorest and most in need. In these years I have forcefully insisted on repeating this priority. Also the members of the General Council have contributed to re-enforcing this message through their own observations in the different countries. We are a Congregation that was raised up by the Holy Spirit for young people, and among these with absolute priority, the poorest and most in need. Not in all the Salesian houses in the world are the poor the ones we are working for. Many times the families are quite ordinary, humble, hard-working. However the presence also of other youngsters less in need, thanks to their contribution, makes it possible to offer education, formation and evangelization to many others who would hardly have any chance had they not come in contact with Don Bosco and with Salesian houses. I remind all the Provinces in the world that when it is a question of undertaking a process of discernment or of making a Province decision of any kind, it should be borne in mind that such a choice ought to help us to be more faithful to the charism and to the priority option on behalf of those most in need. In the case of any doubt whenever there might be one, this ought to be the criterion: the poorest and the most in need, as it was for Don Bosco. => Together with the priority of the presence among the young and the option for the poorest, evangelization and education to the faith ought to be always special feature of our Congregation. «Woe to me if I do not preach the Gospel!», the Apostle Paul writes. Not infrequently we are conscious of our limitations. Various social contexts at times hamper us and we do not always know the best way to act and we feel helpless... However, the efforts to undertake real evangelization and education to the faith are genuine. To this should be added the sensitivity also to involve the families of our young people in the Salesian mission. We are aware that working in a pastoral way with families remains “an unresolved problem.” We have said this on many occasions but we are taking the necessary steps. These years have seen much progress in this area. => Significant efforts are being made in the field of formation and particularly in the area of the formation of the formation personnel, whether for the prenovitiate, or in the formation of the directors of novices, or in the preparation of formation personnel for the other stages. To this should be added the task, undertaken in four Regions of the Congregation, in dialogue with the Rector Major and his Council, to set up a new geographical distribution of the houses of formation: a task that has had to be put on hold given the profound changes experienced in some Provinces in recent years. This reorganization of the houses of formation applies to the Interamerica Region, the America South Cone Region and the two Regions of Europe. For the Regions of Africa and Madagascar, South Asia and East Asia Oceania it is still in the pipeline but with a firm commitment on the part of the Rector Major and his Council to deal with the situation. Obviously the General Chapter will have something very significant to say on the formation of the Salesians of Don Bosco as a response to the theme of the Chapter itself: «What kind of Salesians for the youth of today?» And without doubt we will be given a splendid opportunity to be more faithful also today and to respond to what the Lord is expecting from us, in a world and in a complex society where the Salesian charism is extremely relevant and is more than ever necessary. => No less is the effort being made by the Congregation in relation to the Economy and to economic transparency in all parts of the world. We know that situations are not the same everywhere. Nevertheless it is important to know that very signficant steps forward are being taken. => The situation regarding social communication in the Provinces varies greatly. Some have taken very significant steps so as not to reduce social communication solely to the use of technological means but to appreciate it as a language, as a means to making pastoral ministry more incisive and always with a clear intention of making the good that is being done visible and known about. In other areas of the world the situation is poorer and we need to continue to develop it. What weaknesses are more apparent? => The most evident, which I would dare to say is common in apostolic religious life (or active religious life) in the whole Church, is the weak manner in which we bear witness to the fact that we are consecrated persons, in other words God’s witnesses. Our life, more by what we are and not only by what we do, ought to make visible and transparent the humanity of God among the people. Dear Confreres, the GC27 faced up very well to this situation and we have made considerable progress; but this still remains one of the weaker points. In fact, we feel more comfortable doing things, being creative, managing and organising rather than through our way of living, praying, speaking and working bearing witness to the fact that we are consecrated to God. I would dare to say that this is our “Achille’s heel”. => And we still have to continue to grow in the coming years in the sense of identity and of belonging to our Congregation. There are two other things that I consider very important and which I have spoken about in the 70 Provinces and Vice Provinces that I have visited. From the first months at the beginning of my service as Rector Major, I began to notice something that I shared with the General Council and which together we have examined further. I was very surprised when at the end of November 2016, Pope Francis gave a private audience to the Union of Superiors General: a meeting that the Pope wanted with the 117 Superiors General and that was held in the Hall of the Synod of Bishops. The Pope spoke to us about what he had on his mind, and he spoke to us as a father speaks to his sons, very well aware of our state as religious; he spoke to us with total freedom, without anything being recorded, without television or other media present, and he offered us his vision of the Church and of Religious Life. At one point the Pope told us about his concerns in regard to two large problems that are afflicting the Church. With exceptional force he told us that these problems are called clericalism and power-seeking. It is easy to immediately think of our Congregation, because in some cases these temptations are knocking loudly at our door and there are some confreres who give in to them. At the same time these temptations are so subtle that they present themselves as being helpful, even to the point of appearing as a very normal way of acting, quite appropriate and even correct. By clericalism there is no intention to refer to the situation of Salesian priests. In our Congregation seventy per cent of Salesians are also priests and this is a wonderful way of living out the one religious vocation to which we are called: that of being Salesians of Don Bosco, as Salesians who are priests or as Salesians who are brothers. Instead, clericalism has a lot to do with believing that, by the fact of beng a priest you have all the authority and everything has to pass through your hands. It has to do with the temptation to careerism. It is very much connected to the creation of a state of dependence – and there are confreres who love to have people who “are dependent on them”. The second danger is in regard to the temptation to power. When I say ‘power’ I am not referring directly to authority. If this is exercised in an evangelical spirit of service, there is no danger of power-seeking... But when the responsibility, the office, the authority are exercised as power (not infrequently with a sense of pride) and lived as an exercise of power over others since they depend on our economic resources, or on our being able to employ them, or they help one or another just as they feel like it.... Well then, in these cases it is necessary to go back to living according to the Gospel so as not to fall into the nets woven by the temptation of power. And we must not believe dear Confreres that we are immune to this danger. All of us and every day - starting with the one writing this, we must examine ourselves before the Lord with regard to this danger and ask His grace to live constantly in the dimension of gift and of simple and transparent service. Dear Confreres. I cannot finish this letter of mine without referring to a final point that I consider important. We know from our Constitutions and Regulations that in the Church we are recognised juridically as a Congregation of Apostolic Life with a charism that has a preference for the young and among these the poorest and the abandoned. We do not belong to those Congregations recognised officially as “missionary”. This is true. Nevertheless, we also know that the missionary dimension of the Congregation was something essential and a priority for Don Bosco and it is and must remain so also for us today. From this point of view the Congregation will continue to enjoy good health if it continues to maintain and to intensify its own missionary character. I find great joy for this reason, and many times I thank the Lord for this gift and for the fact that He continues to take care of our Congregation and to call many confreres to live out their Salesian missionary vocation ad gentes, ad vitam. In these years I have seen an increase in the number of confreres responding to this call of the Lord. I have seen in the Provinces the great respect shown to this call, and the availability of the confreres even at the cost of “losing” confreres from their own Province in order to offer them to other parts of the Congregation. I emphasise the generosity shown by some Provinces that would have had many reasons in human terms to say that their own needs did not allow them to help others. Nevertheless, with a faith-vision and truly believing that it was the Lord who was calling, they facilitated all the necessary arrangements. Finally I have seen that faced by the specific help requested, for example for the founding of a new presence in a refugee camp at Palabek (Uganda) with the creation of an international community, various Provincials made available excellent confreres of whom they had need. All of this speaks of a faith-vision; it speaks of a sense of the Church and of the Congregation; it speaks of generosity. And let us not forget that the Lord will never be outdone in generosity. Last year there was a 60% increase in the number of confreres, who after a serious process of discernment personal, provincial and subsequently in dialogue with the Rector Major and the General Councillor for the Missions, have expressed their readiness for the missio ad gentes, ad vitam. There is no doubt that together with a passion for the evangelisation and education of the young, with the Salesian passion to be on the side of the poorest and most needy, and together with the growing desire to accompany families more and more, and the journey of faith and the vocational discernment of their children, the response to the missionary call is another of the great blessings and a sure way of fidelity for the Congregation. I send you my greetings my dear Confreres. I want to do so in the same informal and familiar tone that I wanted to give to this letter, handing on to you what I carry in my heart. Thank you to each and every one of you for the generous response to the Lord with a Salesian heart. Thank you for the life of each one of you my dear Salesian Confreres, the true wealth and patrimony of our Congregation. Thank you for having wanted to live a beautiful and authentic way of life according to the Gospel, with Don Bosco, like Don Bosco, and for being the Salesians that today’s world and our young people are waiting for and which they need. May our Mother the Help of Christians follow and accompany us. She has done everything, She is following us, doing everything! And may Don Bosco follow us, guiding us as his sons, guiding his beloved Congregation.